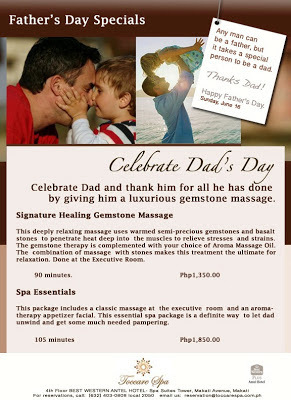 Girl Kuripot Girl Kuripot: @TheFoodAlphabet, Win a Relaxing Toccare Spa Experience for Dad from Antel Spa Suites! @TheFoodAlphabet, Win a Relaxing Toccare Spa Experience for Dad from Antel Spa Suites! Here's a little something for Fathers' Day from our friends over at The Food Alphabet blog! To join, simply follow the Rafflecopter. You have until June 15, 2013! Click here to join The Food Alphabet Toccare Spa Antel Spa Suites Giveaway.